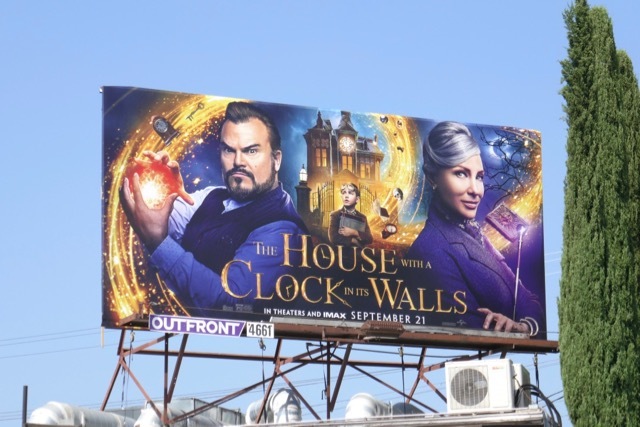 If you're looking for a film to get you and your kids in the spooky mood for the fast-approaching Halloween season then The House with a Clock in its Walls may be the movie for you. In this children's horror fantasy directed by Eli Roth and based on the 1973 novel written by John Bellairs and illustrated by Edward Gorey, a recently orphaned young boy named 'Lewis Barnavelt' (played by Owen Vaccaro) goes to live with his uncle in a creaky old manor house with a mysterious clock ticking in its heart. 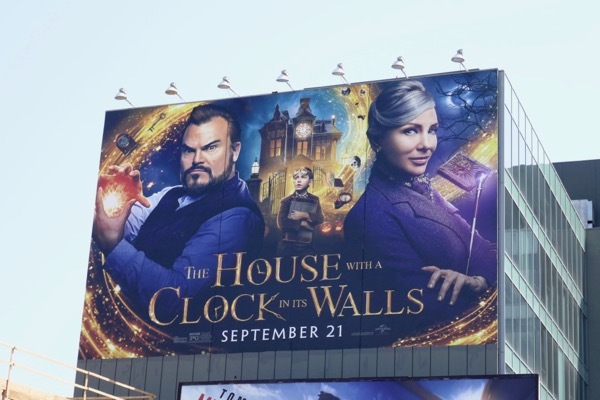 Turns out his uncle 'Jonathan Barnavelt' (played by Jack Black) is a warlock and his best friend and neighbour 'Florence Zimmerman' (Cate Blanchett) is a witch, and there's all kinds of dark secrets and evil supernatural forces for the trio to face. 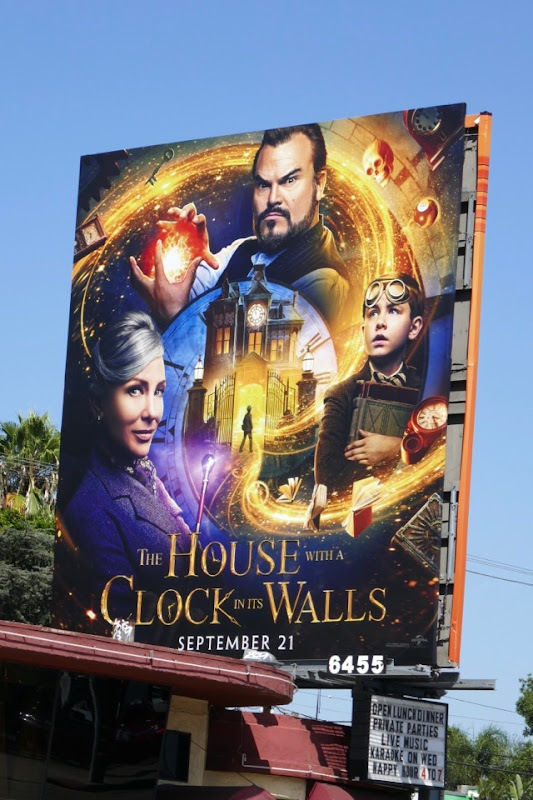 These magical movie billboards were spotted along Highland Avenue, La Cienega Boulevard, Pico Boulevard and Lankershim Boulevard from August 13 to September 8, 2018. 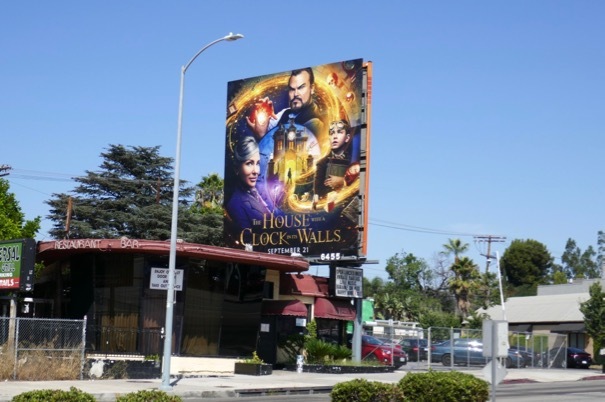 Fans of Jack Black can also check out these Jumanji: Welcome to the Jungle billboards, these TV billboards for The Brink and this Gulliver's Travels movie billboard. Meanwhile Cate Blanchett admirers can enjoy these Ocean's 8 movie billboards and this Giorgio Armani Si fragrance billboard. 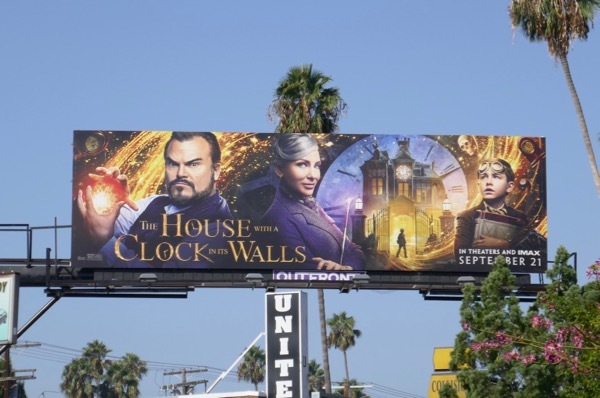 Daily Billboard always thinks that films with really long titles are always harder to market, especially in the hashtag-driven social media culture we live in, so let's hope that doesn't live to haunt this particular cinematic offering.